Fig. 4. CHIP binds to MET using different mechanisms. (A) Co-immunoprecipitation of full-length CHIP and MET. 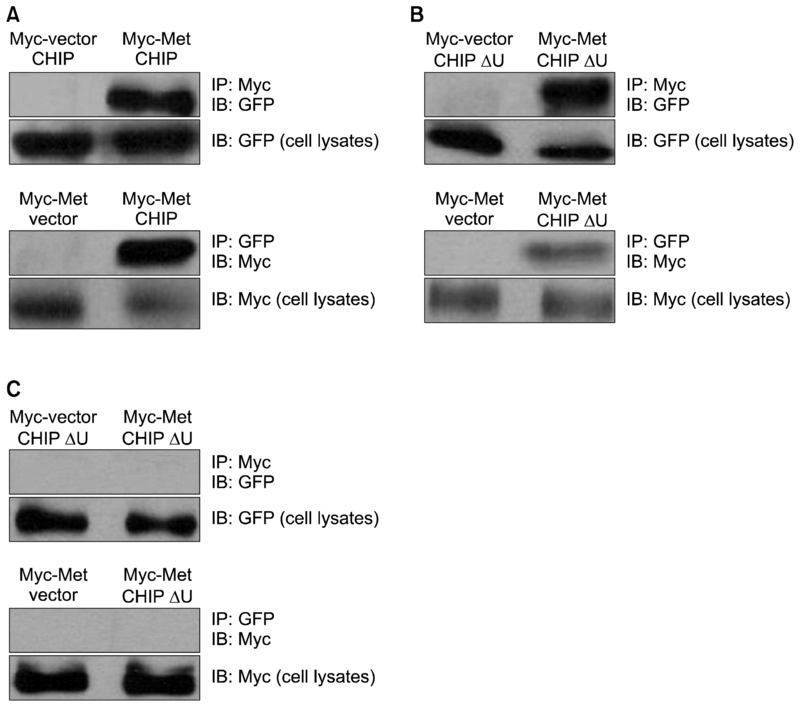 (B) Co-immunoprecipitation of CHIP lacking the U-box domain (CHIPΔU) and MET. (C) Co-immunoprecipitation of CHIP lacking the TPR domain (CHIPΔT) and MET. MET, mesenchymal-epithelial transition factor; CHIP, C-terminus of Hsp70-interacting protein; TPR, tetratricopeptide repeat; GFP, green fluorescent protein; IP, immunoprecipitation analysis; IB, immunoblotting analysis.